Brussels is the capital of Belgium and is considered by many to be the headquarters of the European Union, as two of its four main institutions have their headquarters in the city. Brussels is, first of all, a city located in the centre of Belgium and its capital, but it sometimes also refers to the largest municipality of the Brussels-Capital Region. This municipality inside Brussels is correctly named The City of Brussels, which is one of 19 municipalities that make up the Brussels-Capital Region. The municipality has a population of about 140,000 while the Brussels-Capital Region has more than a million inhabitants. 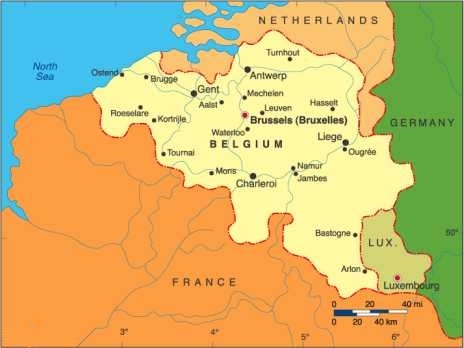 The Brussels-Capital Region is a region of Belgium in its own right, alongside the Flemish Region and Wallonia. Geographically, it is an enclave of the Flemish Region. Regions are one component of Belgium's complex institutions, the three communities being "the" other component: the Brussels inhabitants must deal with either the Flemish Community or the French (speaking) community for matters such as culture and education. Brussels is also the capital of Flanders and of the French Community of Belgium (Communauté française Wallonie-Bruxelles in French) ; all Flemish capital institutions are established here: Flemish Parliament, Flemish government and its administration. Two of the three main institutions of the European Union - the European Commission and the Council of the European Union - have their headquarters in Brussels: the Commission in the Berlaymont building and the Council in the Justus Lipsius building facing it. The third main institution of the European Union, the European Parliament, also has a parliamentary chamber in Brussels in which its committee meet and some of its plenary sessions are held (the other plenary sessions are held in Strasbourg, and its administrative headquarters are in Luxembourg). Brussels is also the political seat of NATO, the North Atlantic Treaty Organisation, and the Western European Union (WEU). The name Brussels comes from the old Dutch Bruocsella, Brucsella or Broekzele, which means "marsh (bruoc, bruc or broek) home (sella or zele)" or "home in the marsh". "Broekzele" was spelt "Bruxelles" in French. In Belgian French pronunciation as well as in Dutch, the "k" eventually disappeared and "z" became "s", as reflected in the current Dutch spelling. The names of all other municipalities in the Brussels-Capital Region are also of Dutch origin, except for Evere, which is of Celtic origin. In 977, the German emperor Otto II gave Lower Lorraine, the empire's western frontier to Charles, the banished son of King Louis IV of France. Mention was already made of Brussels at the time. However, the founding of Brussels is usually known to happen when a small castle was built by Charles around 979 on an island (called Saint-Gery island) encompassed by the Senne river. Brussels.org, Useful addresses for tourists in Brussels. My daughter, Sarolta and I visited Belgium and Brussels a couple of times during our 1978 trip around Europe. Nothing outstanding, that I can remember, uh, perhaps the huge triangular shaped E.U.H.Q. it was the European Common Market H.Q. in those 'good old days'.